Microsoft’s Surface RT tablet hasn’t quite taken off in a way that we’re sure Microsoft would have wanted it to. In fact, we suspect that’s the reason behind a new initiative that the Redmond outfit is putting into place that will see discounted slates being made available to educational institutions. First leaked, then pulled and now flittering around the ether, the news now comes from ZDNet that Microsoft is indeed offering highly discounted Surface RT tablets to educational establishments across a wide range of territories. And when we say highly discounted, we mean it. Allegedly beginning yesterday and closing on August 31st, Microsoft is offering up a range of Surface RT configurations, both with and without the company’s super special keyboard covers. 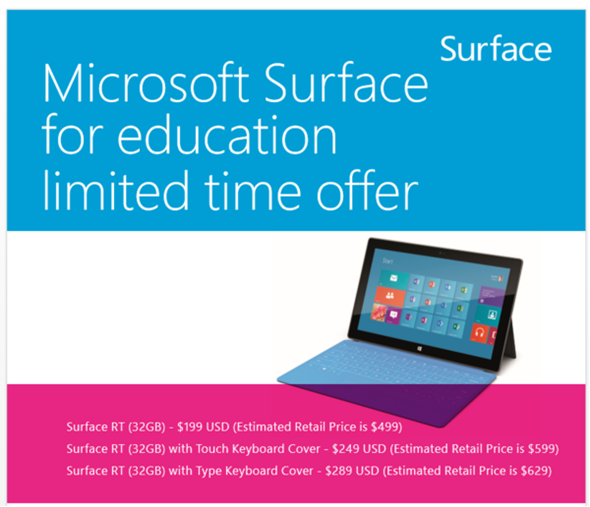 For example, a $499 32GB Surface RT will cost just $199, and the same model with a touch keyboard cover will run $249. Throw in the Type keyboard Cover rather than the Touch Cover, and educational institutions will need to hand over just $289. That’s a massive saving on the $629 retail price. This isn’t just open to those in the United States either, with the full list of eligible countries being: the US, UK, Canada, Australia, Austria, Belgium, China, Finland, Denmark, France, Germany, Italy, Ireland, Korea, Japan, Mexico, Luxembourg, the Netherlands, Portugal, Norway, Singapore, Russia, Sweden, Spain, and Switzerland. So yes, that’s 25 countries, hopefully yours is in there. Educational institutions are not forced to buy a certain number of units to get these discounts, though Microsoft does point out that the offer will end prematurely should it run out of a designated supply. So, if this proves popular then it’s entirely possible some may be disappointed. 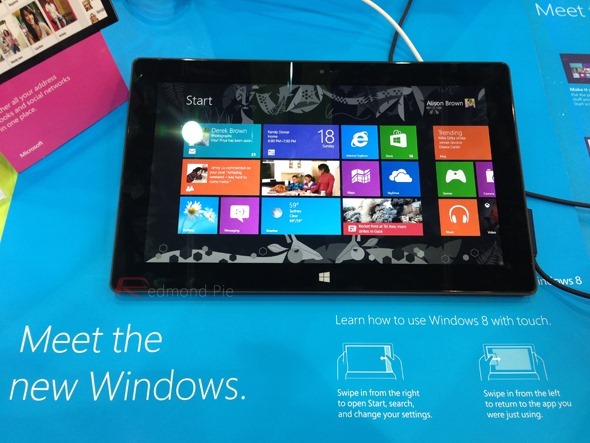 Microsoft is obviously trying to get its Surface RT into the hands of kids who may otherwise be using iPads at home. Getting its own tablets out into the wild is part of the battle for Microsoft, and highly discounted tablets for schools K12 through to college and university is a good way to go about doing that. Apple has historically done a good job of doing a similar thing, and Microsoft is aiming to beat the iPad maker at its own game. It will be interesting to see how Microsoft plays this game out despite the falling sales compared to its fierce competitor. A Microsoft spokesperson has confirmed the deal and will go live on June 24.